Education, Audiovisual and Culture Executive Agency (EACEA) – Eurydice has published the Structural Indicators for Monitoring Education and Training Systems in Europe 2016 report, which contains more than 30 detailed structural indicators, up-to-date figures, definitions, country notes and a short analysis of recent key policy developments and reforms in five areas: early childhood education and care, achievement in basic skills, early leaving from education and training, higher education and graduate employability. 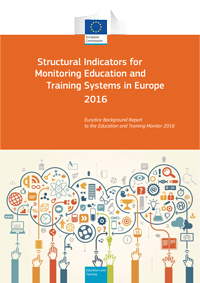 The report provides background and complementary information on a number of structural indicators examined in the Education and Training Monitor 2016, the annual publication of the European Commission which describes the evolution of Europe's education and training systems based on a wide range of evidence. It follows the progress made by the EU Members States towards achieving the targets set by the Europe 2020 and the Education and Training 2020 reform processes. The full version of the Structural Indicators for Monitoring Education and Training Systems in Europe 2016 can be freely downloaded here.